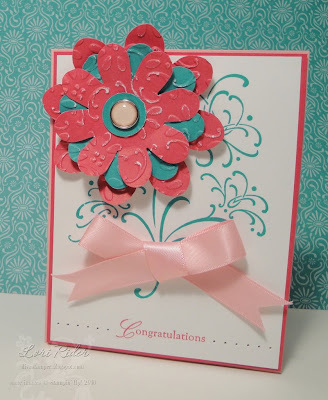 OCC Challenge - Blooming Blossoms! Hello friends... Welcome to another fun challenge here at Our Creative Corner!! We want to thank all those that stopped by & played along with our butterfly challenge, it's amazing how many different kinds of butterflies are out there & what you can do with them!! Here is a beautiful sample from last week's challenge. 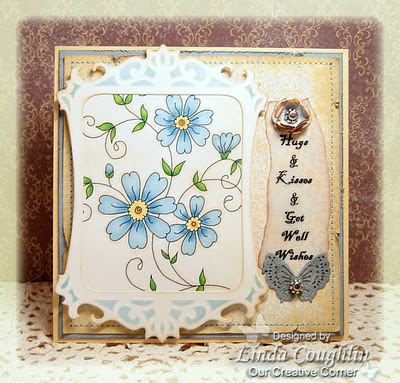 We are featuring Lori Burkitt from Stamping with LuLu - what a gorgeous layout and design!! 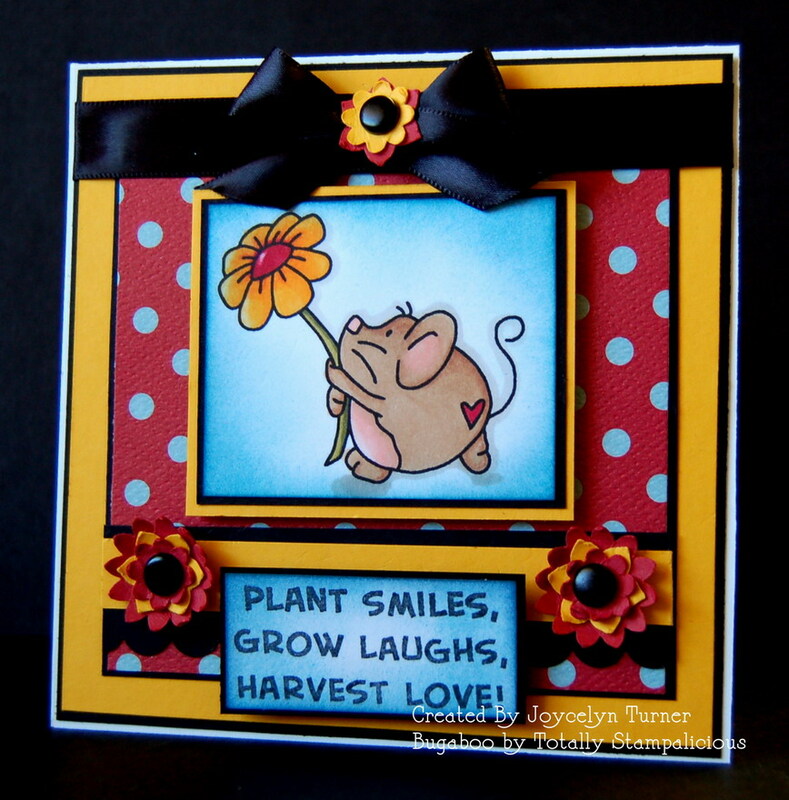 You can check out Lori's blog to see more of her stunning creations!! Our sponsor this week is Paper Maniac! 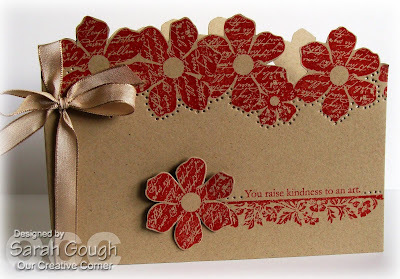 They are an online store for paper crafters. They have a wide variety of stamps, papers, tools, and embellishments. Patti, the owner is generously giving away a $30 Gift Certificate & Free Shipping to one random participant. In order to qualify for this prize, you have to submit your creation no later then Friday, April 30th by 10:00 PM EST. 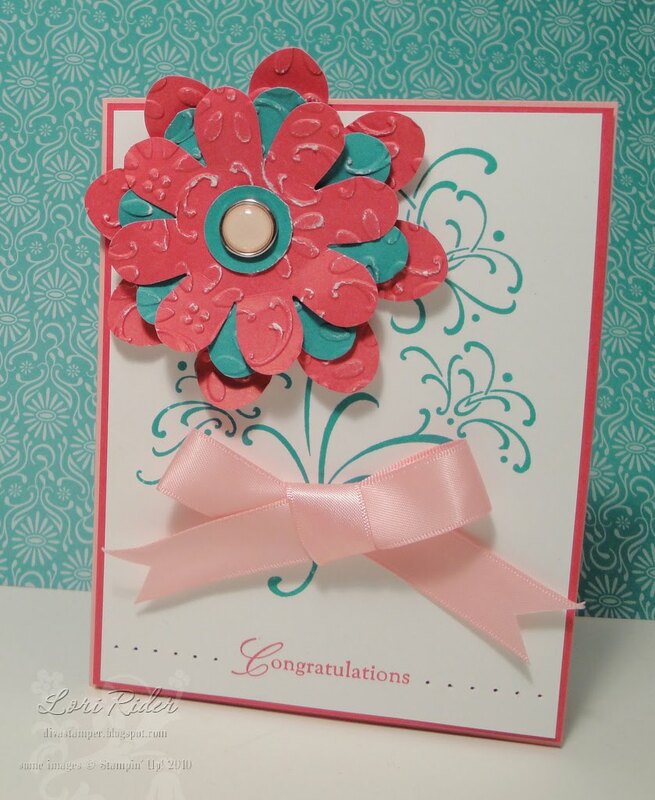 Be sure to stop by the Paper Maniac store to see all their fabulous goodies! Now, onto this week's challenge. 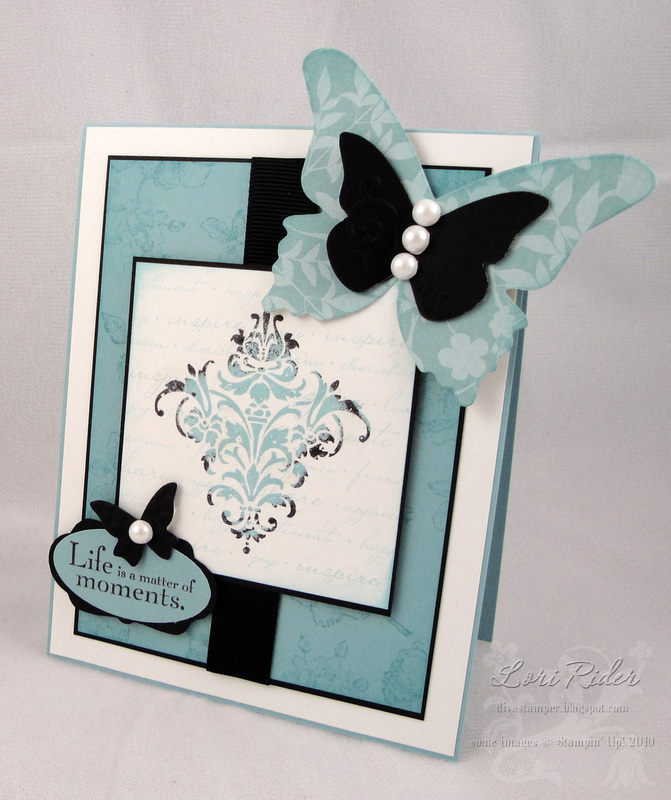 So far this month we've used buttons, bows, and butterflies. 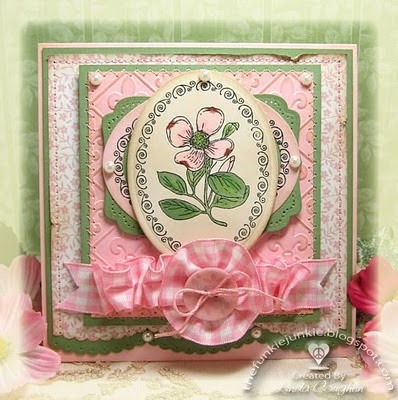 To keep with the theme of B's, Dana Grothaus is challenging us to use blossoms on our cards. We can't wait to see all your beautiful blossoms and flowers. 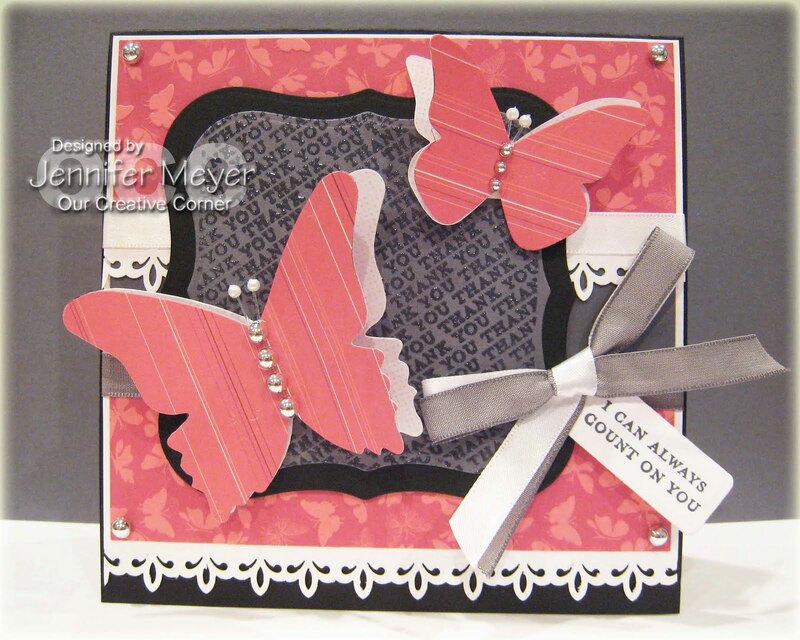 OCC Challenge - Beautiful Butterflies!!! Good Morning!!! Welcome to another weekly challenge from Our Creative Corner. 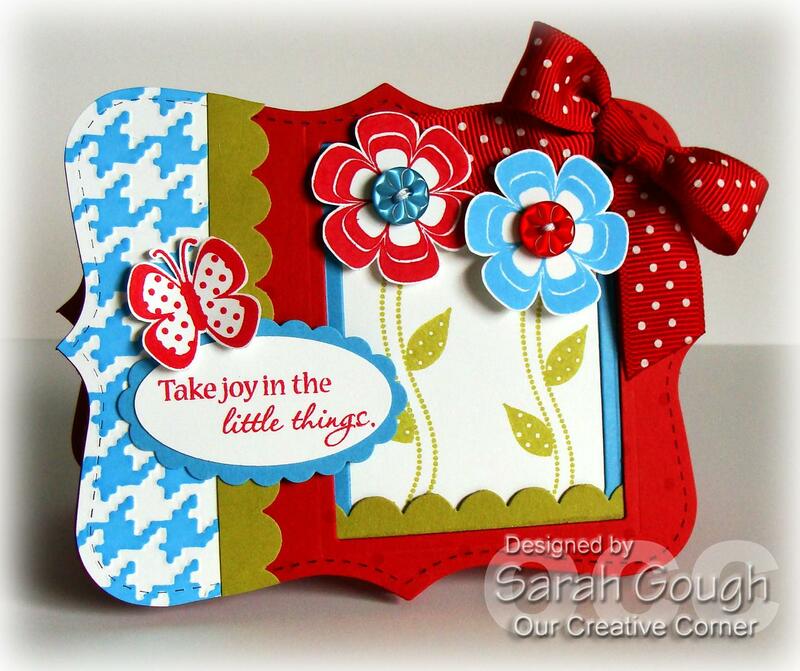 We greatly enjoyed seeing all your lovely creations last week using bows!! We LOVE seeing all of your card displayed, what a beautiful parade of cards!!! 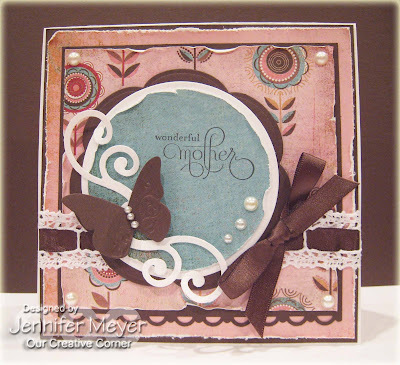 We'd love to showcase this great card from Kelly Becker (below)! 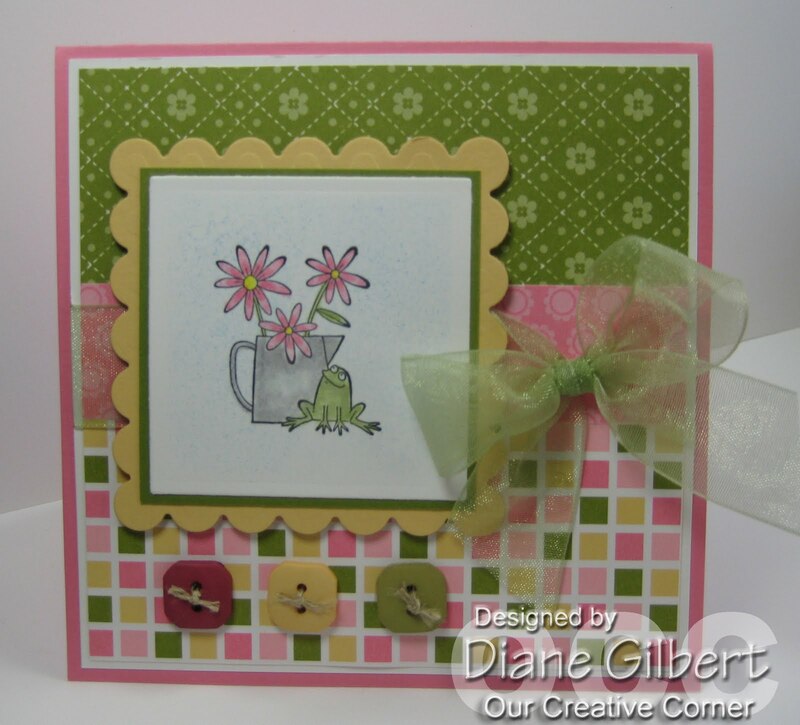 Just look at that gorgeous spring card she created and those flowers are fantastic. You can see more of Kelly's creations on her blog, La Maison De Papier. Congrats Kelly!!! Now, onto this weeks challenge. This week, Dana Grothaus is challenging us to use butterflies on our cards. 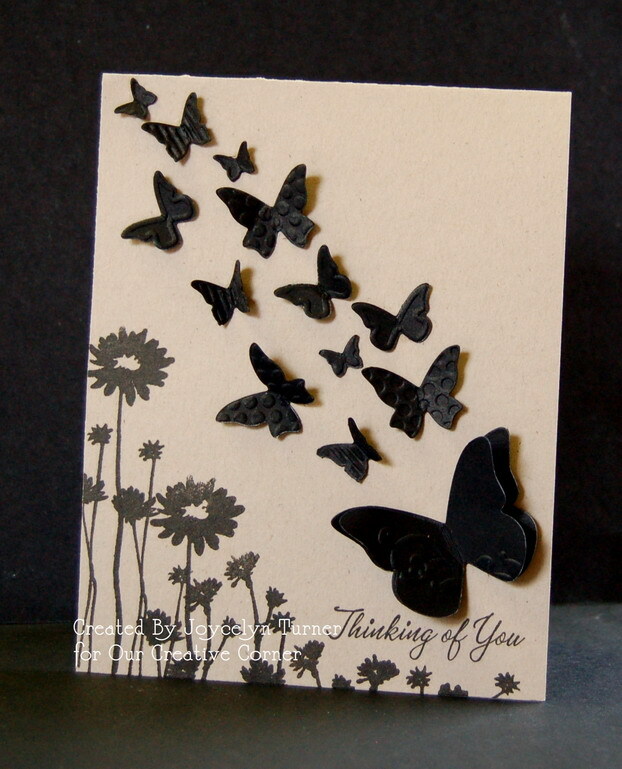 They can be big, small, punched, stamped, on patterned paper... we just want to see your beautiful butterflies!!! 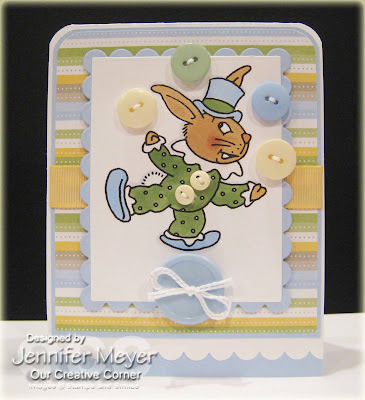 Welcome back to another creative challenge over at the OCC! We want to thank all those that stopped by and played along with our button challenge last week. Your cards & projects were amazing and as you know there are countless ways to use buttons. We were all so impressed and inspired by you!! Speaking of last week's challenge, we would like to spotlight two particpants from last weeks challenge. 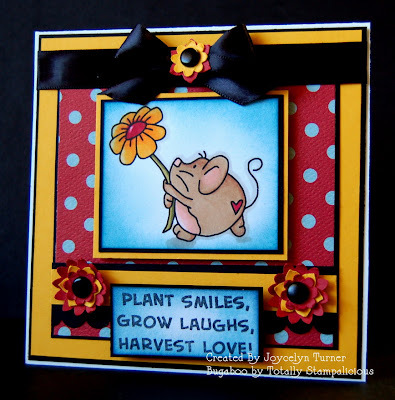 Michelle Ip from Michelle Jo Gallery , what a an amazing design - way to go, Michelle!!! and Nicky Hsu from Craft ~ Coffee ~ Cat. Below you will see Nicky's beautiful sample. Please stop by both of their blogs to see more of their amazing work!! Now, onto this week's challenge. Our April hostess, Dana Grothaus, has challenged the OCC to bows. 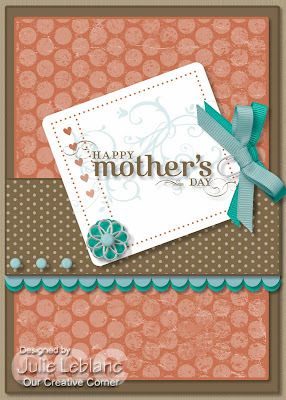 Please incorporate a bow on your card/project - big or small, bows make a great accent to any card/project. We hope you are inspired by the samples below and we look forward to seeing your designs this coming week!! Our Creative Corner - Break Out the Buttons! Hello OCC friends! Thank you so much to all the participants in our sketch challenge last week. It was truly amazing to see the versatility of a single sketch. Sadly, we have to announce that of two of our design team members have stepped down from the OCC - Jenny Gropp & Silke Ledlow. We will miss you both and we want to thank you for being part of the OCC Design Team. We wish you both all the best and please know you always have a place here at Our Creative Corner! 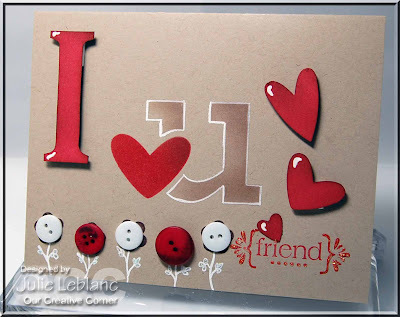 As we say goodbye to Silke & Jenny, we say "hello" to three NEW members, so without further adieu, we would like to extend a warm welcome and introduce to you Diane Gilbert (My Little Stamping Spot), Julie Leblanc (Kewl Stamps-n-More) and Sarah Gough (Thinking Stamps) here at the OCC! 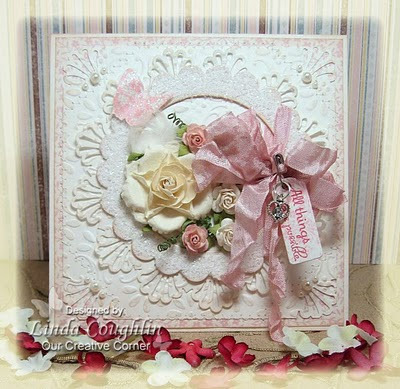 Please join us in welcoming them and pop by their Blogs to see their beautiful creations! Before we get to this week's challenge, we would like to announce the winner of the $25 gift certificate to Repeat Impressions that was so generously donated by Wendy, the owner. The winner is Julie Smith!!! Congratulations Julie, please email us so we can get your goodies to you. Here is Julie's card using the sketch from last week. 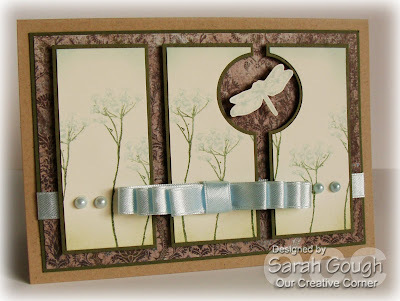 Such an elegant and peaceful card. 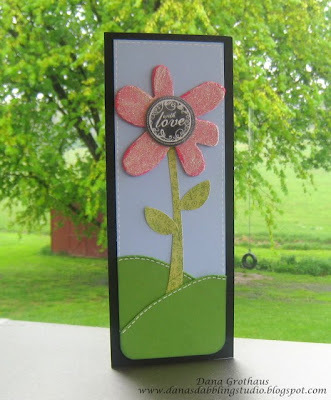 Please stop by Julie's Blog, Paper and Such to see her awesome creations. Now, onto this week's challenge. We have a new month, and that means a new hostess. 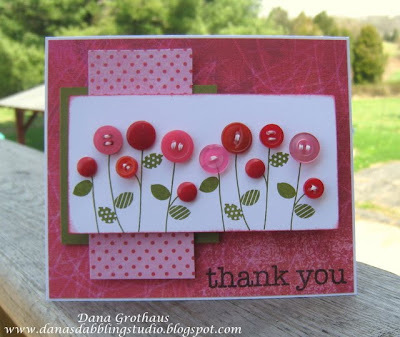 Let's welcome our April hostess, Dana Grothaus. 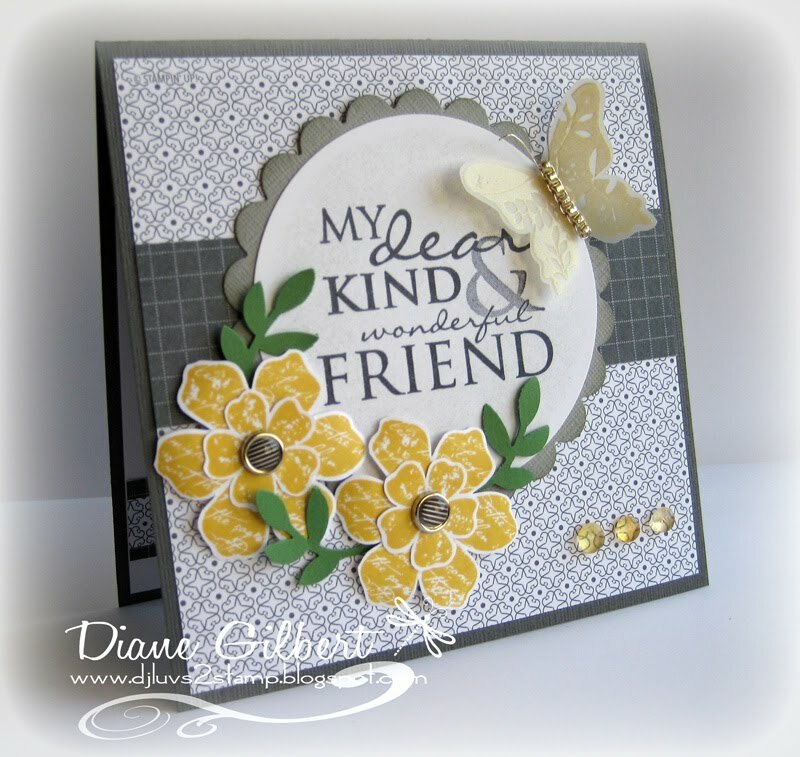 This week Dana is challenging all of us to use buttons on our cards or projects. Anyone can play and we can't wait to see your creations.